The need to service and maintain the drainage elements of type C waterproofing systems is paramount to their long-term success. This is highlighted in BS8102:2009 the Property Care Association (PCA) code of practice for Remedial Waterproofing of Structures below Ground and by the distributors of products and equipment used to create waterproof basements. 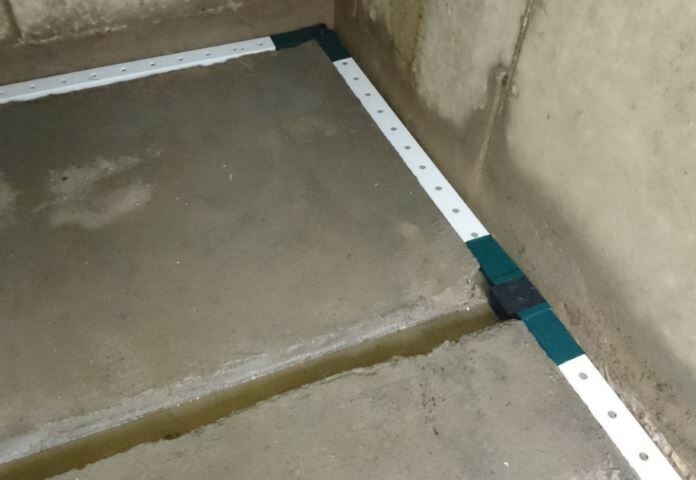 This guidance note is designed to highlight the need to undertake regular maintenance of the drainage elements of all type C, underground waterproofing systems. It will also consider the duties this may place on contractors, specifiers, homeowners, and property managers who install, control or own such systems. This guidance will not provide detailed information on how the servicing visits should be scheduled or performed. Site conditions, design, materials and the machinery used will all play a part when deciding on the frequency and scope of service visits. The basic principal of a Type C waterproofing system is that a cavity is formed between the ground retaining elements and the internal finishes. These cavities are used to direct water to collection channels that in turn deliver water to a point where it can be discharged. This process of water management is commonly achieved by the use of cavity drain membranes (CDM), perimeter drainage channels and sumps and pumps. Type C waterproofing systems will fail if water is allowed to exert a pressure on the system so it is essential that cavities, drainage channels sumps and pumps remain free from any blockage that could inhibit the movement of water. 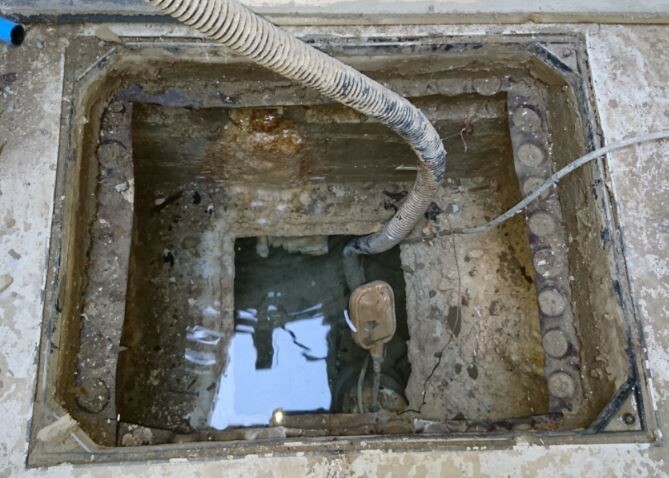 Cavities drainage channels and sumps are susceptible to the deposition of silt, fines and other particulate matter that may enter the building from the ground. The deposition of Calcium Carbonate (free lime) can occur in circumstances where new concrete is encountered or chalky soils exist. Drainage channels should be fitted with accessible rodding points that allow for jetting or washing. These openings are usually silted where channels change direction. Openings must be sited to allow periodic inspection and cleaning to be undertaken. 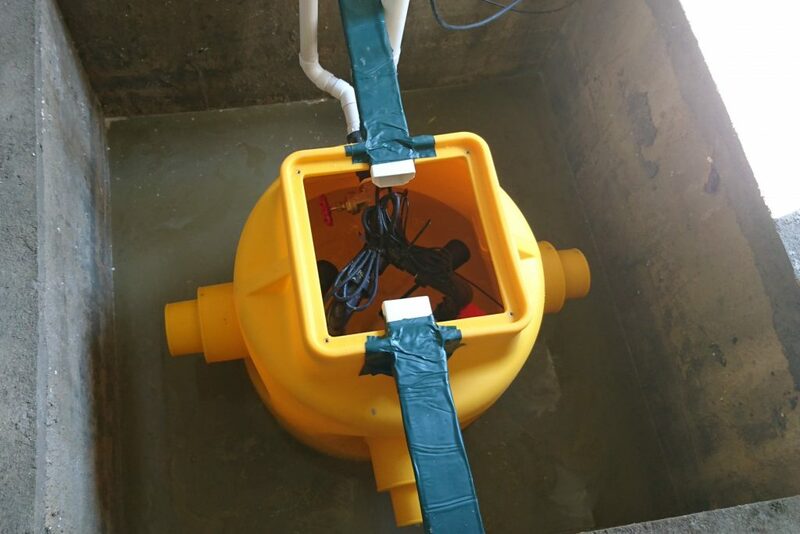 Sumps should be installed in locations that allow easy access for periodic servicing. Pumps and associated pipe work should be accessible and installed in such a way as to allow easy servicing and when necessary replacement of elements of the system. A schedule of maintenance should be agreed. This schedule should then be adhered to throughout the life of the waterproofing system. Trained, competent service engineers should be employed to maintain and service type C waterproofing systems. Preservation Treatments recommend PPS (Packaged Pump Services) and details are included within our report/quotation. Initially inspections should be undertaken to the channels, sump chambers and pumping units. Examinations should also be carried out to the discharge pipes and associated valves. Any accumulation of silt, fines or free lime should be noted before cleaning operations commence. The pump unit should be inspected to ensure that it is operating correctly before any flushing operations commence. Channels – Perimeter channels and any channels below the floor finishes should be thoroughly flushed with water in order to remove any built-up deposits. This is usually undertaken by using a hose or water jetting device at each of the channel inspection points. In some circumstances, it may be possible to flush the system by back filling the channels from the sump. This method of flushing should only be undertaken by an experienced service technician. 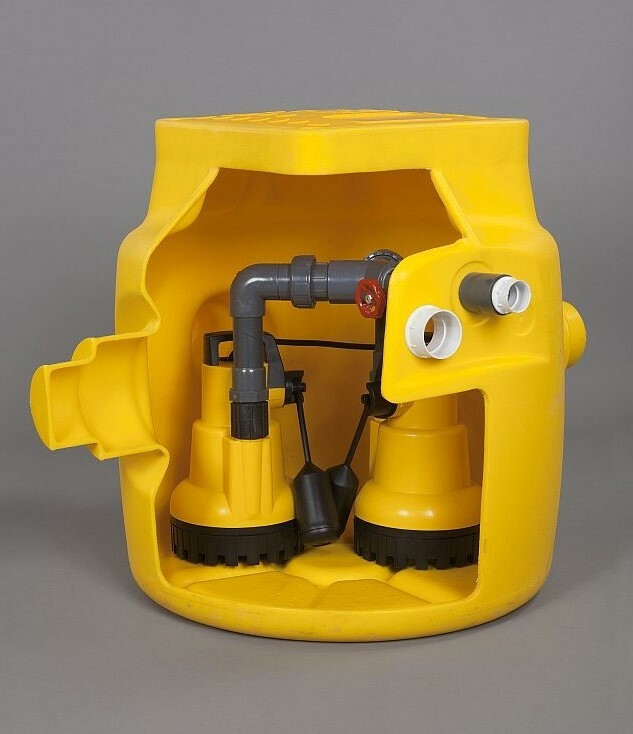 Flushing water will discharge into the sump so care should be taken to protect the sump pump from fouling on any materials that are washed from the channels into the sump during these operations. Care should also be taken so that water from the cleaning process does not overwhelm the pumps. The sump chamber should be inspected for damage and cleaned to remove any materials that may have accumulated. Discharge pipe work should be inspected and cleaned. Special attention should be paid to areas where water may collect and stand within the pipes during periods when the pump is not in operation. This is particularly important when free lime is deposited as discharge pipes and non-return valves can become obstructed. Maintenance of the pump unit will vary according to the type of pump configuration installed. Information relating to the servicing of individual pumps and configurations should be provided by the manufacturer. Consideration should be given to the operation of the main and back up pumps; the condition of any batteries and switchgear should be established. Seals, washers and valves may require inspection and replacement. The inspection and alteration of electrical circuits must be undertaken by a registered electrician. Alarms and any back up switches that are fitted should be inspected and tested. It should be remembered that the sump pump is a mechanical device and as such will fail eventually. It is therefore good practice to consider the service life of a pump and plan to replace the unit long before the pump fails. It can be extremely difficult to estimate how long a pump might last so it is important to seek advice from the supplier of the pump when estimating service life. Discharge points (the point where water collected by the waterproofing system and discharged to the outside) should be inspected and maintained as appropriate. Where a type C waterproofing system is partly reliant on external land drainage or dewatering outside the building, special attention should be paid to the condition and service requirements of these elements. Type C systems should be inspected and serviced at least annually but in some circumstances the period between services may be considerably shorter. Site conditions, design, materials, machinery used and the implications of any system failure will all play a part when deciding on the frequency and scope of service visits. It is advisable to schedule the first service visit within three months of the system being commissioned. This will highlight any problems, allow for the removal of debris that may have been deposited in the drainage channels during the construction phase and allow the service engineer to assess the risk posed by free lime and silt that may be washed in to the system. The service life of the pump and batteries. Detailed advice on the frequency of servicing visits is available from manufacturers and suppliers of waterproofing products. The information contained on this page is given in good faith and believed to be correct. However, it must be stressed that of necessity it is of a general nature. The precise condition may alter in each individual case and Preservation Treatments is therefore unable to accept responsibility or any loss howsoever arising from the use of the information contained herein. Much of the wording and content of this document has been reproduced with permission from ‘Best Practice Guidance Type C Waterproofing Systems’ © Property Care Association (PCA), March 2015. All Rights Reserved.